On An Overgrown Path: Is this really the future of classical music? 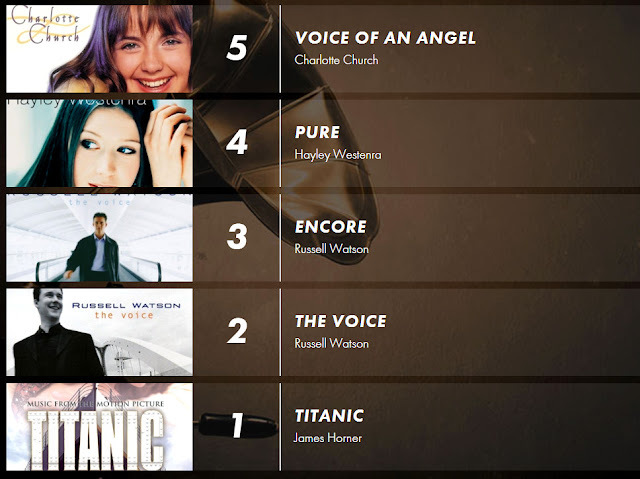 Hopefully all the classical music experts who zealously tweeted news of Classic FM's "huge increase in under-35 listeners" have seen the just-announced Ultimate Classic FM Chart of best-selling albums. For those who haven't the top five albums are shown above in reverse order. Is this really the future of classical music? Why don't otherwise very intelligent people think before they tweet? There has been some misguided discussion on Facebook about this post. To head off that discussion I posted the following comment which I believe is worth repeating here. No outrage was expressed in my post about the repertoire in the Ultimate Classic FM chart – of course people can listen to what they want to. What was expressed was the view that it is both wrong and misleading to conclude that because Classic FM has increased its under-35 audience for its specific style of popular classical programming - Russell Watson, Charlotte Church etc - that the same young audience will migrate to more challenging mainstream classical music. Contrary to received wisdom about the importance of crossover genres, I propose that there are two distinct audiences for classical music, let's call them popular classical and mainstream classical audiences, and that the migration between the two genres is grossly overstated. Some of the more progressive forms of rock music and jazz may well be more productive hunting grounds for new audiences than the popular classical audience. My supposition that there are two distinct classical audiences and the two rarely crossover with any longevity is supported by none other than the BBC. See article below with headline - 'BBC Proms end experiment with Strictly and Sherlock after audiences fail to stick around'. So no more complaints about outrage please. Instead let's for once try to see the bigger picture which indicates pretty clearly that, as my post suggests, Classic FM audience trends have little relevance to the future of mainstream classical music.